GAITHERSBURG, Md.—Two federal agencies have teamed to create the first-ever system for linking accurate assessments of risk from wildland fires to improved building codes, standards and practices that will help communities better resist the threat. The proposed Wildland Urban Interface (WUI) Hazard Scale addresses fires that occur where developed and undeveloped areas meet, and is described in a report* released today by the U.S. Department of Commerce's National Institute of Standards and Technology (NIST) in collaboration with the U.S. Department of Agriculture's U.S. Forest Service (USFS). The problem of WUI** fires, particularly in the western and southern regions of the United States, has been growing more prevalent as housing developments push into wilderness areas. According to the Bureau of Land Management's National Interagency Fire Center (NIFC), the 10 years since 2002 saw an annual average of nearly 71,000 WUI fires recorded and 1.9 million hectares (4.7 million acres) burned. Through the end of October 2012, the number of WUI fires for the year is below the average at slightly more than 54,000, but the amount of damage is nearly double with 3.7 million hectares (9.1 million acres) having burned—approximately 1,000 times the total area of Rhode Island. The monetary toll from the destruction is staggering; the NIFC estimates that federal agencies spend an average of $1.2 billion per year on WUI fire suppression alone, with state and local agencies contributing millions more. To combat such tremendous losses, NIST and USFS have developed a proactive approach that could one day provide buildings and the communities in which they reside with increased resistance to WUI fires. The WUI Hazard Scale is designed to consistently measure the expected risks from fire and embers during a WUI fire event for individual locations within a community, taking into account the ever-changing nature of those hazards. "Wildfires are among the few natural disasters in which risk levels can rapidly change as the event progresses and the threat doesn't weaken with distance away from a well-defined epicenter, as in a tornado," Mell says. "For example, if your home is nestled deep within a neighborhood away from the leading edge of a fire, you might not be at risk early on. However, the danger to your home dramatically increases if a neighboring house, the surrounding landscape or a nearby vehicle catches on fire." Fire behavior in wildlands and the wildland urban interface is a function of fuel (both vegetation and structures), topography and local weather. The WUI Hazard Scale accounts for local and transient variations in these factors so that each specific location can be rated as to its susceptibility to both fire and embers. The range of ratings can then be used to create a map of the different levels of risk throughout a community and pinpoint where protective measures or "hardening" of structures are most needed. Once the overall exposure risk in a particular zone is determined, the researchers say they can predict the likely response of individual structures and even components of those structures (such as whether or not a wooden deck is treated with a fire retardant) to embers and fire. As portrayed in today's report, the WUI Hazard Scale currently considers fire and ember exposure from a single source, wildland fuels. The researchers have designed the scale to easily accommodate additional threats and plan to include exposure from three other sources associated with WUI fires—burning structures, ornamental vegetation and vehicles—at a later date, using the same methodology. In their report, Maranghides and Mell portray the WUI Fire Hazard Scale for fire and ember exposure as a three-dimensional matrix (see Figure 1). One side of the matrix represents four types of fuel sources; a second, three types of topography; and a third, three wind conditions. Field data collected from and computer modeling of prescribed burns (controlled fires used in wildland management) were used to define the specifics of the fuel, topography and weather characteristics attributed to different "exposures"—four for embers and four for fire, ranging in severity from 1 (no exposure) to 4 (most severe exposure). Based on this, each block in the WUI Fire Hazard Scale matrix is assigned a measure of severity for both embers and fire. These exposure ratings are used to map a community's varying risks from embers and fire (see Figure 2). Figure 2. Wildland Ember Exposure on a Community Using the WUI Fire Hazard Scale: The ember risks shown in this illustration increase from E1, no likely exposure, to E4, highest likelihood of exposure. To link the scale to a means of protecting communities, Maranghides and Mell have proposed four "building construction classes" defined for different risk zones in a mapped community. Structures in a zone designated with a low exposure risk from embers or fire would require no special construction considerations. At the other end of the spectrum, a structure built in a zone with the greatest exposure risk would require a high level of construction hardening measures such as windows and doors being covered with insulated, noncombustible coverings and landscaping that was irrigated and well maintained for low flammability. "If homes and other buildings in the most susceptible zones can be built or retrofitted to high-risk standards, they could potentially serve as a 'frontline defensive wall' for the structures in the lower-risk zones they surround," Maranghides explains. 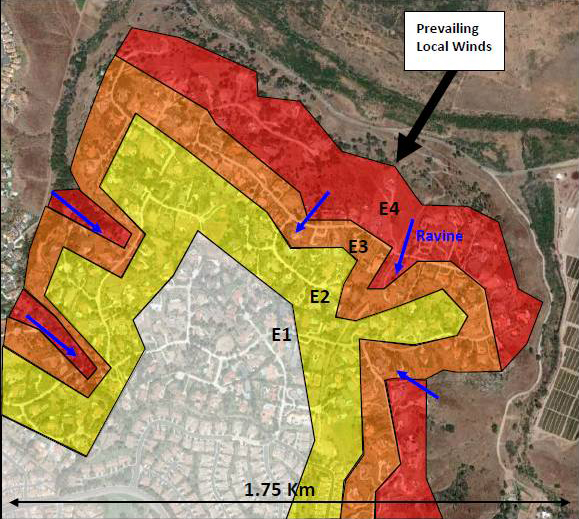 "In effect, we may be able to mitigate the entire dynamic of a WUI fire event if the frontline structures don't ignite." Maranghides says that now that the hazard scale proposes a framework for addressing the WUI fire problem, the next step is to collect the appropriate data to make it viable. NIST and USFS, he says, will do this through field evaluations of exposure characteristics in a wide variety of communities and surveys of areas that have recently experienced WUI fires. The two agencies also will be working with various public and private stakeholder groups toward acceptance and implementation of the proposed scale and building construction classes with the goal of improving standards, codes and practices. NIST's work on WUI fires is part of its statutory responsibilities for enhancing disaster resilience by reducing the risks of fires, earthquakes, windstorms and coastal inundation on buildings, infrastructure and communities, including facility occupants/users and emergency responders. The mission of USFS is to sustain the health, diversity and productivity of the nation's forests and grasslands to meet the needs of present and future generations. The agency manages 193 million acres of public land, provides assistance to state and private landowners, and maintains the largest forestry research organization in the world. * A. Maranghides and W. Mell. NIST Technical Note 1748: Framework for Addressing the National Wildland Urban Interface Fire Problem – Determining Fire and Ember Exposure Zones using a WUI Hazard Scale (2012). ** USFS defines the wildland urban interface, or WUI, as an "area where structures and other human development meet or intermingle with undeveloped wildland or vegetative fuels."